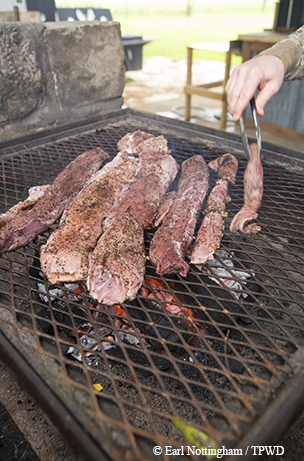 A weekend’s pursuit of deer and hogs culminates in a mouthwatering wild game feast. Solana Ranch is the kind of place that makes you feel blessed to call Texas home. Nine thousand acres of Central Texas beauty, purposefully stewarded for over 50 years by one family — the Michauxs — to enhance native habitat and benefit the creatures that live there. Turkey, white-tailed deer, quail, dove and even the endangered Salado salamander thrive on the ranch, largely due to the efforts of Kirk and Julie Michaux and their children, Lisa and Mike. The Michauxs manage an extensive but thoughtfully restricted hunting and nature tourism operation on Solana designed to ensure that every hunter, bird watcher and visitor has a superb experience. So when I was invited to join Marcus Paslay, the award-winning chef and proprietor of Fort Worth’s Clay Pigeon Food and Drink, for a bow hunt and eat-what-you-kill dinner (prepared by the chef himself), I instantly knew the right place to go — Solana Ranch. 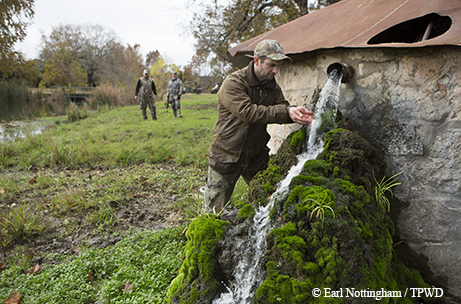 Chef Marcus Paslay samples the cool spring water from the spring house at Solana Ranch during a hunt-and-cook weekend. I arrived at Solana on a rapidly cooling November day. Mike Michaux, my friend of 35 years, met me at the ranch’s hunting headquarters. Mike stands 6 feet 3 inches tall and is a limestone block of a guy — solid in body and solid in character. His frequent laugh is contagious and loud. I don’t see him often these days, but when I do our friendship is such that we pick up right where we left off, never missing a beat. I was worried our hunt could be washed out by the triple punch of cold front, Gulf moisture and the remnant of Hurricane Sandra colliding over Central Texas that afternoon. “Think we’ll be OK?” I asked, pointing to the gunmetal gray sky. Mike manages the hunting operations at Solana Ranch. He limits grazing on the ranch’s low-fenced pastures to maximize forbs and other food sources for free-range, native white-tailed deer and (less intentionally) the ever-present feral hogs. Mike and his team manage more than 80 (mostly archery) hunting blinds. Solana allows only one commercial hunt per month during the season and limits participants to only seven hunters. This way, animals are not pressured. Hunters can use multiple locations during a weekend and are almost guaranteed to see a lot of game. Mature bucks are abundant on Solana Ranch, but we were after meat, not horns. Our targets were limited to does and hogs. When Chef Marcus arrived, he was wearing a worn brown jacket and soiled ball cap. He carried his bow case in one hand and an array of neatly bundled chef’s knifes in the other. Looking at him, you would never guess that he’s a trained Culinary Institute of America chef who has prepared gourmet meals all over the country — from remote Alaskan fish camps to the tony Four Seasons resort in Vail, Colorado — and that he is now the executive chef of one of the best “from scratch” restaurants in Texas. Mike and I liked him immediately. Marcus’ Clay Pigeon Food and Drink has become a staple of Fort Worth’s growing food scene. Emblazoned on the Clay Pigeon’s stucco walls are the words “Made From Scratch.” Chef Marcus and the Clay Pigeon do exactly that. Marcus cures his own bacon, bakes his own bread (including sourdough from yeast cultures he has maintained for decades), serves meat and fish he butchers, and offers desserts of home-churned ice cream. Marcus prepares his own charcuterie and spices foods with herbs grown in pots on the Clay Pigeon’s patio. His menu is based on high-quality seasonal foods. All of these things cost more and take longer than simply ordering food from a supplier. I asked Marcus why he goes to this trouble and expense. It strikes me that Marcus runs the Clay Pigeon much the same way the Michauxs run Solana. They each put quality over quantity and work to provide hard-to-find experiences, even when they could make more money by doing things the easy way. Like Mike, Marcus is a native Texan, passionate about hunting and fishing. After his formal training in New York, he took positions that combined his love of the outdoors and fine cuisine. He learned to butcher fresh meat and fish on the Big Island in Hawaii. He cooked under the tutelage of a James Beard Award-nominated chef in Seattle and prepared rustic American cuisine at Rough Creek Lodge in Glen Rose. When Marcus and his wife decided to settle down in Fort Worth to start a family, he combined all he learned from these varied experiences with his deep respect for hand-crafted food and created the Clay Pigeon. 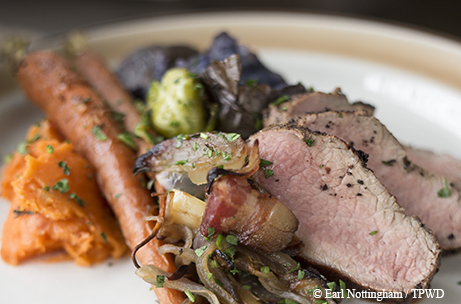 Our plan was simple: Hunt that afternoon and the next morning and then have Chef Marcus prepare a Clay Pigeon-worthy feast from the harvest. With bows in hand, Wittliff and Paslay discuss the morning's hunt as they return to camp. Just before our first hunt, Mike introduced us to one of Solana Ranch’s venerable hunting guides, David “Shep” Shepperd. 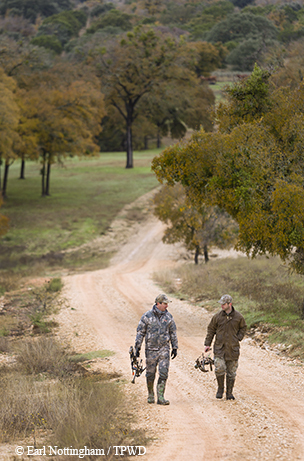 Shep has guided hunters on Solana for more than 12 years. He specializes in hog hunting, and is renowned for it. For a time, he appeared on A&E’s American Hoggers program. His country accent is so thick, the show had to subtitle his speech. “Y’n riddy?” Shep asked, when it was time for the afternoon hunt. We told him we were. “N ets ’oad un ip ’n o.” And we bundled into Shep’s Polaris ranger and headed for our blinds. A misty rain was falling. The three creeks that run through Solana — Salado, Rumsey and Buttermilk — were flowing heavily and over the roads. The oaks, elms and brush lining the limestone bluffs above the creeks were painted in abundant yellows, reds and oranges, and the pasture grasses still clung to a bit of summer green. The country was in transition — covers pulled back, but not quite tucked in for winter. It was a glorious time to be on Solana. Shep rounded a corner, and we startled a flock of 20 or so turkeys. It clearly worked. Turkeys seemed to be around every bend at the ranch. Shep dropped Marcus off at a box blind he had constructed with tall slits to accommodate a bow hunter. The blind was tucked in some cedars; a feeder was about 20 yards away. A north wind was blowing from the feeder right at the blind, so the setup was good. I tried my luck from a little tent-like pop-up blind in another pasture. “Em hegs unnin’ awl ’n ear,” Shep assured me. Thirty minutes after Shep drove away, the feeder went off. A stampede of hoofs clattered across the rocks, and a sounder of 20 or more hogs suddenly appeared. I picked out a young pig, drew my bow and let fly. The small pig went down by the feeder, and the other hogs ran off. To my surprise, 10 minutes later, the sounder returned and I bagged another small pig. Marcus’ luck was not as good. He shot at a nice doe, but missed. We were up at 4:30 the next morning. It was cold, wet and inky dark. Shep dropped me at a tree stand in a different pasture. I could barely see the feeder. Puddles of water were everywhere. The feeder went off just as the first hint of morning light appeared. Kernels of corn flew, splashing as they fell into the water. Not long after, a lone black shape emerged under the feeder. The shadowy figure looked almost like a bear. I knew it was a boar hog. His muzzle sloshed in the water as his teeth ground corn. Just before sunrise, the boar walked in front of the feeder, quartering away. I drew, settled my pin and shot. The lighted nock on my arrow embedded, and the hog ran. I heard him pile up just around a motte of cedar trees about 50 yards away. When Shep picked me up, he gave a brief nod at the hog, and then we went to find Marcus. A small eight-point bolted as we pulled up to his tree stand. Marcus climbed down and told us he shot a doe. Shep wanted to get his dog to track the deer, but Marcus pointed to a spot not 30 yards away. There was the doe. Marcus had made a perfect shot. We arrived back at headquarters, plenty of venison and pork in hand. 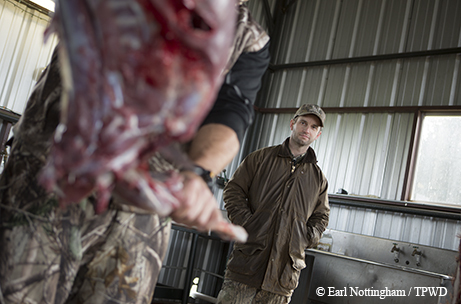 Marcus Paslay of Fort Worth's Clay Pigeon Food and Drink watches as the loin is removed from a freshly killed boar. “Now the real work begins,” Marcus said with a grin. When Shep brought Marcus the fresh loins from the doe and boar, Marcus soaked them in an ice bath of water, sugar, salt and citrus. After checking the oak-wood fire that was already burning in Solana’s big outdoor pit, Marcus and I headed for the kitchen. Marcus — chef’s knife flashing — began to peel and chop an abundance of mushrooms, purple potatoes, Brussels sprouts, home-cured bacon and fresh herbs. He diced onions, mashed sweet potatoes and roasted carrots. He seemed to do three or four things all at once. The air was soon filled with the appetizing aroma of sautéing bacon and onions. As he moved around the headquarters’ kitchen, Marcus told me stories. He talked about a hunt in the Bitterroot Mountains of Idaho and how he was able to feed a hunting party for nine days from the one deer the hunters harvested on the first day of the hunt. Another time, he was almost fired by the Alaska fishing lodge on his first day on the job. Marcus was in a float-plane flying out to prepare lunch for the lodge’s fishermen when he realized he had forgotten his pots, pans and utensils and had nothing to prepare the meal. “We ain’t going back,” the pilot told him. When the plane landed, Marcus found some cans of corn in the back of the plane. A batch of salmon fritters fried in the cans saved the day (and his job). With the side dishes well on the way, Marcus checked the grill. A layer of white ash now covered the glowing logs. Marcus tested the heat with his hand. Satisfied, he pulled the loins from the ice bath, patted them dry and then coated the meat with a rub of kosher salt, freshly ground pepper and coffee grounds. Marcus placed the loins on the mesh grate directly above the fire. He kept a small probe in his pocket and used it periodically to spear the meat and check the temperature. When Marcus pulled the meat off the grill, he cut a slice off the end. The meat had a nicely charred crust and warm pink center. He handed me the slice, and I popped it in my mouth, pronouncing it perfectly cooked and delicious. Marcus covered the meat with aluminum foil to rest for a while and prepared a salad of frisée, new potatoes and cotija cheese, dressed with a citrus vinaigrette he made earlier. Marcus assembled the meat, vegetables, mushrooms, bread and salad on two large trays. He uncorked a bottle of French Bordeaux wine from the Clay Pigeon’s cellar and placed the food and wine on the service table. The result was both beautiful and mouthwatering. The chef grills pork and venison. Three generations of Michauxs joined the feast: Mike, his father, Kirk, and his son Kirkland. Shep was there, too. We sat at a long table on folding chairs. We raised our glasses and toasted Chef Marcus and Solana Ranch and then tucked in to the perfectly prepared food. All of it was hearty and delicious. The especially satisfying part was that we had harvested the game ourselves that morning. Wash and dry carrots well. Combine all ingredients in a mixing bowl and coat evenly. Place carrots on a sheet tray, making sure not to overcrowd the tray. Roast in a 350-degree oven till cooked through, about 30 minutes. Wash and dry potatoes well. Place potatoes on a sheet tray, making sure not to overcrowd the tray. Roast in a 350-degree oven till cooked through, about 30 minutes (time will vary based on the size of the potatoes). Mix together the coffee grounds and kosher salt. Liberally coat the loin with the coffee mixture. Grill loin over high heat (a wood-burning grill is preferable). an instant-read thermometer), remove from heat and let rest for 5 to 10 minutes. Slice about ¼-inch thick against the grain or the muscle and serve. Notes: If time permits, the texture and flavor of any game meat will be greatly improved by soaking it overnight in ice-cold brine before cooking. The basic ratio for any brine is roughly 1 cup of salt to 1 gallon of water. Add any seasonings/flavors to the brine that you see fit. Combine lettuces and dress with a small amount of vinaigrette (lightly coat). Combine all other ingredients in a separate bowl; lightly dress them as well. On a large platter, arrange dressed lettuces; place remaining ingredients on top and serve.